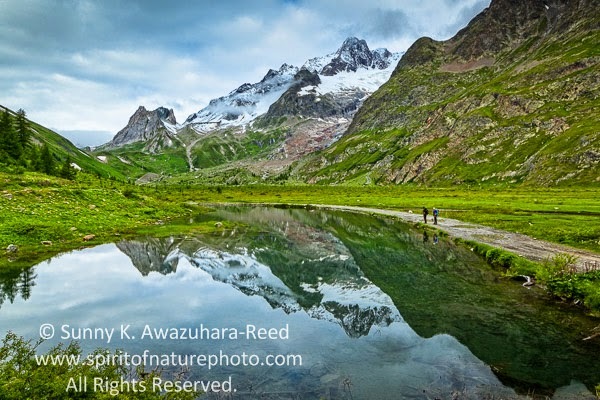 As my first European photo project, I hiked with my camera gear on the 110-mile Tour du Mont Blanc trail in July 2014. The first 3 days were done in drenching rain while I trekked the mountain pass. After crossing the French – Italian border, the weather slowly improved. 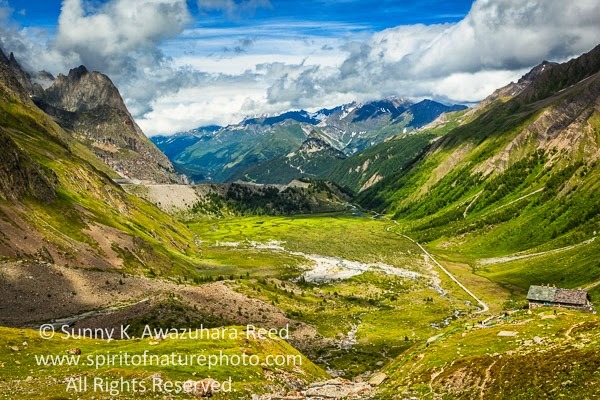 After days of frustration, I finally was able to capture some of the spectacular landscapes in the Alps. 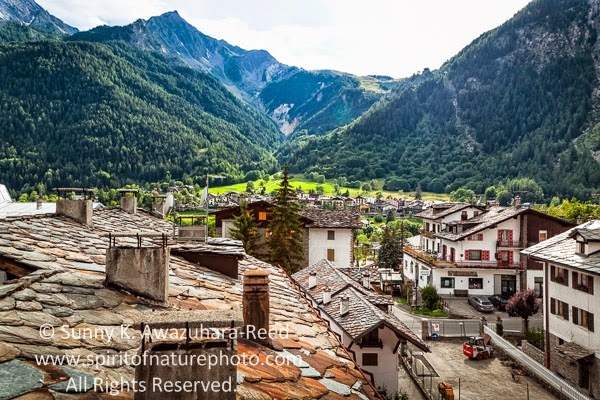 Continuing from my last posting, I made it to the Italian side of Mont Blanc to the town of Courmayeur. 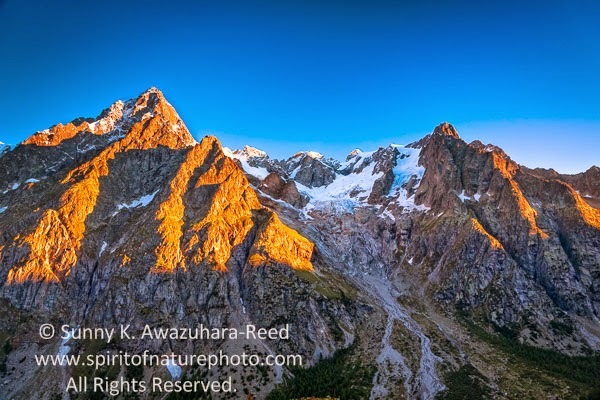 After a few days break at Courmayeur, I headed back on the journey. 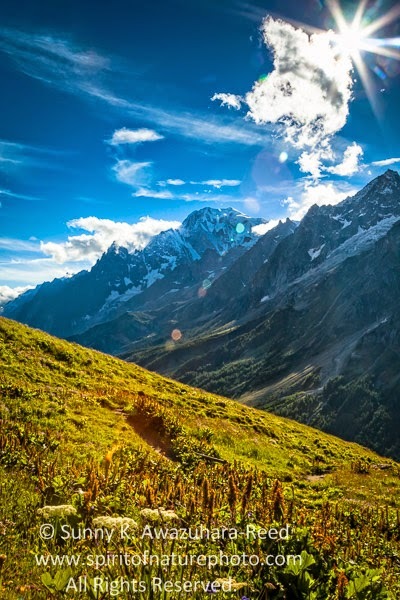 It had been already a week since I began hiking on the Tour du Mont Blanc trail. Leaving the outskirts of town, the trail slowly climbed up through the woods. 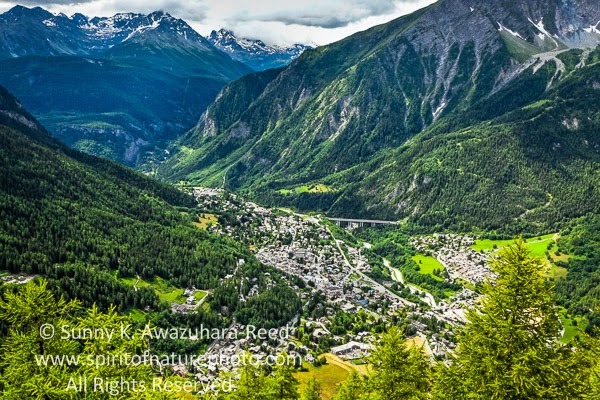 Then, the trail got steeper as I left civilization behind… The town of Courmayeur was already down below! 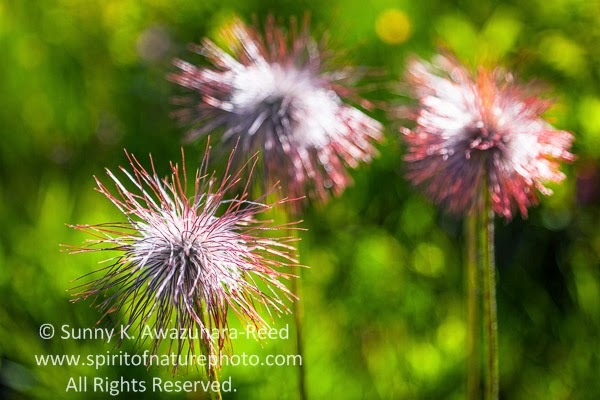 The dense forest opened up with a wildflower meadow. 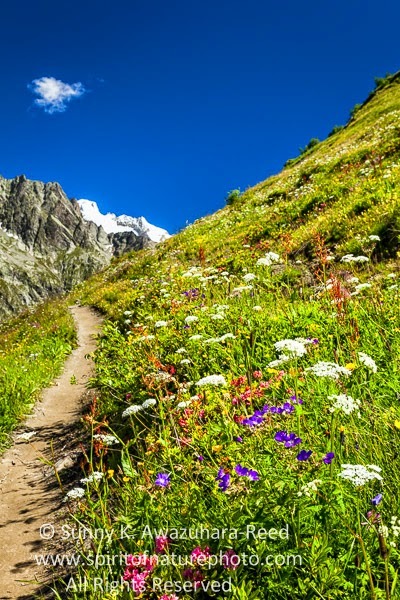 I’m impressed with the abundance of colorful wildflowers in the Alps. As I climbed up higher, the south side of the Mont Blanc range showed up again with the majestic Grand Jorasses rock wall with glaciers. 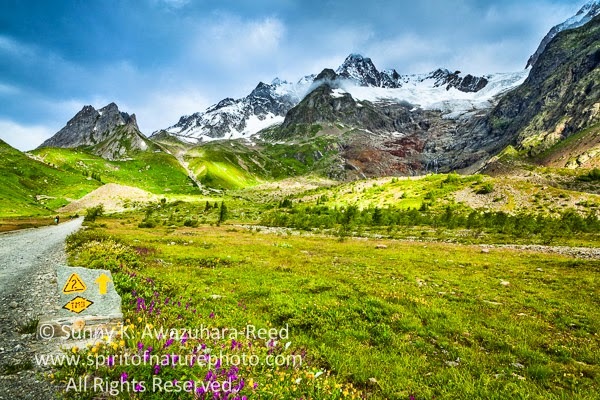 The long awaited sunshine brought bright blue sky above the mountains and the trail. 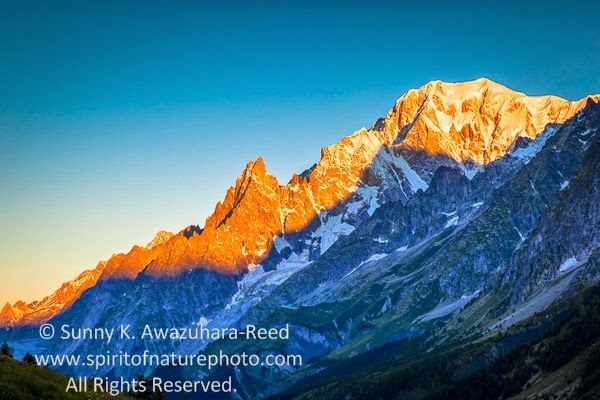 At the late afternoon, the clouds on the peaks slowly cleared out and the entire Mont Blanc appeared from its long absence! The Italian side, the south face of the Mont Blanc summit was different from the French side (North face). Mont Blanc was still out the next morning. 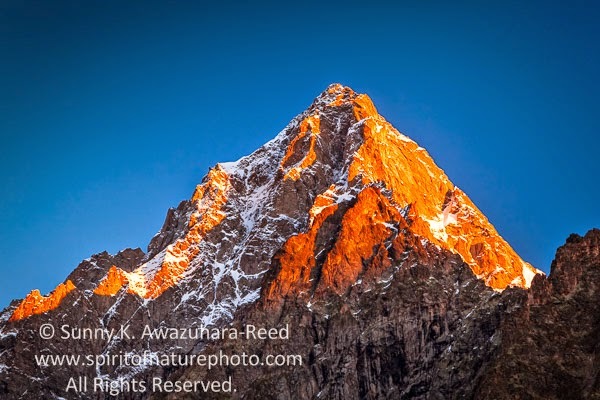 Alpenglow painted the summit at dawn. 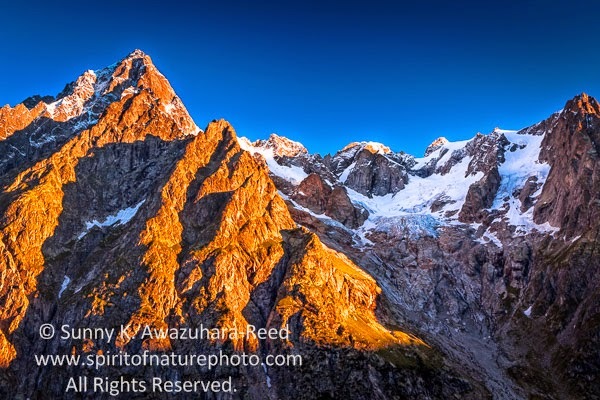 Grandes Jorasses (4,208 m; 13,806 ft) at sunrise. 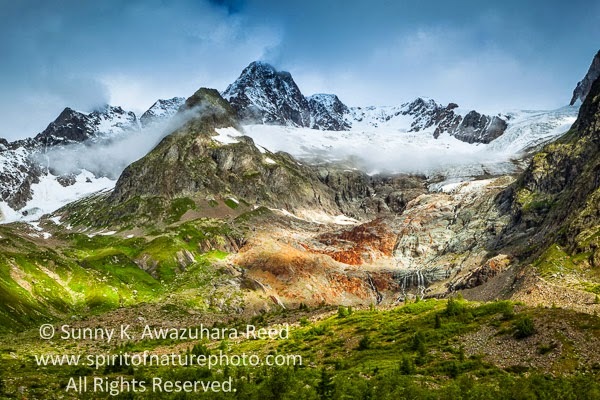 Grandes Jorasses and Frebouze Glacier. This story will be continue on the next blog with new images, please check back. 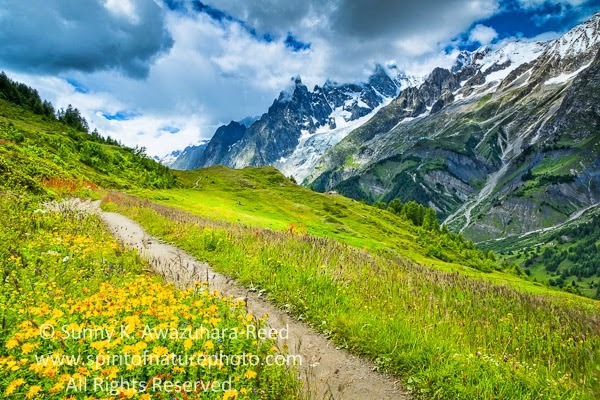 ﻿In July of 2014, I toured, explored and photographed the Alps and after spending a few days in Chamonix, France, I began hiking the famous Tour du Mont Blanc trail, a total of 110+ miles. 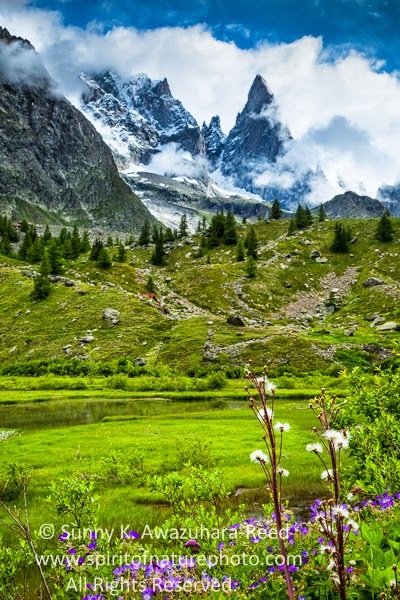 The tour circles the Alps' highest peak; Mont Blanc. Continuing from the last blog posting, I crossed the French - Italian border on a stormy mountain pass the day before. After 4 days of bad weather, the rain finally stopped. It was overcast, but leaving the mountain refuge without rain was a good change. While walking down to the beautiful Veni Valley (Val Veni), the sunshine came through the thick clouds. The lights through the clouds created the pattern on the towering mountains. This entire valley offered outstanding scenery. 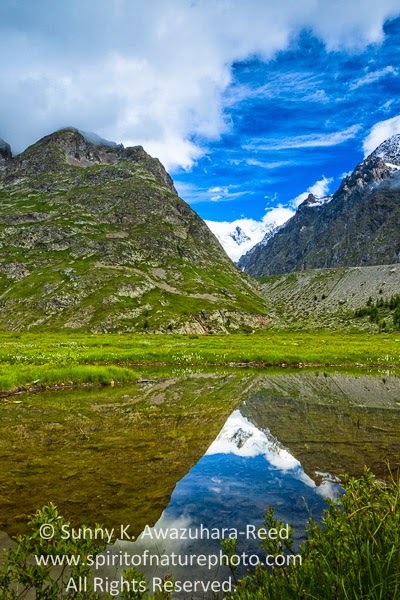 Small lakes, surrounded by fresh greens, reflected the mountain range as a perfect mirror along the trail. 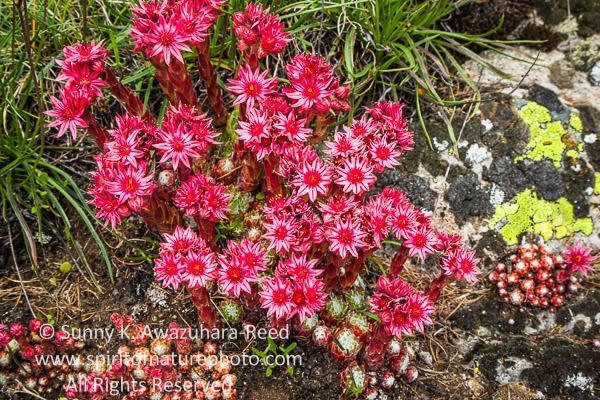 Vivid wildflowers bloomed everywhere in the valley. I just wished that there would be more sunshine and blue sky... I could have spent many more hours photographing this area if the lighting was better. The trail branched off to the higher mountain side which I climbed with my heavy pack. 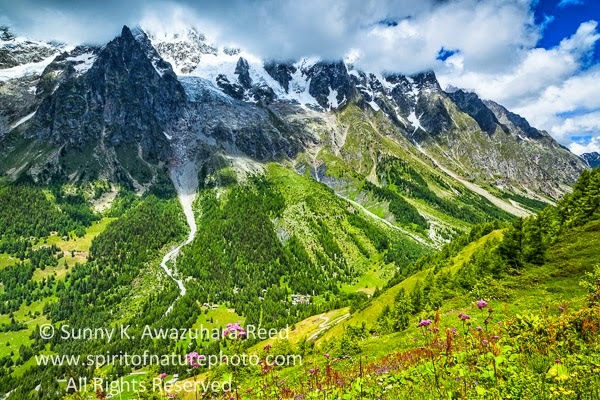 The trail continued along the cliff which overlooked the valley and the south side of the Mont Blanc range with several hanging glaciers. Unfortunately, the weather wasn't cooperating again... The clouds got darker, and it could rain at any moment... it wasn't desirable lighting for photography either. I was frustrated by the lack of photo opportunities since the start of this hike. 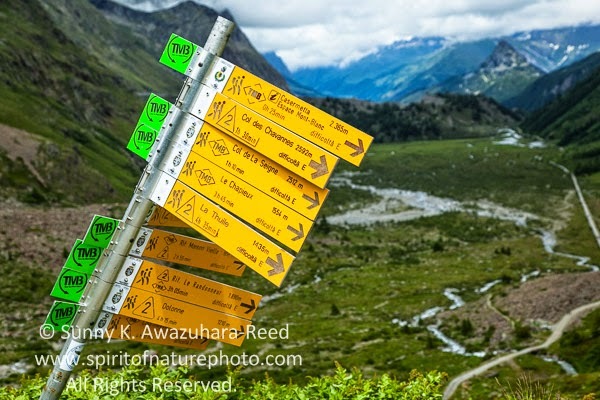 The rain started falling again and got heavier as I was hiking down to the town of Courmayeur. I climbed down steep muddy long switchbacks on the trail in the rain, finally, the town came into view. 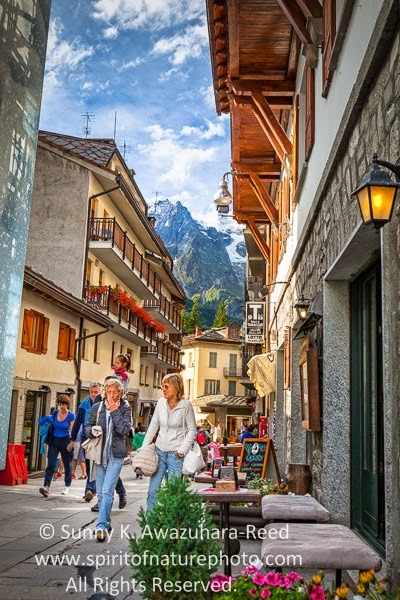 Courmayeur is on the the Italian side along Mont Blanc. (Monte Bianco in the Italian language) Soon after I walked into town and I felt like I was transported back to medieval times! 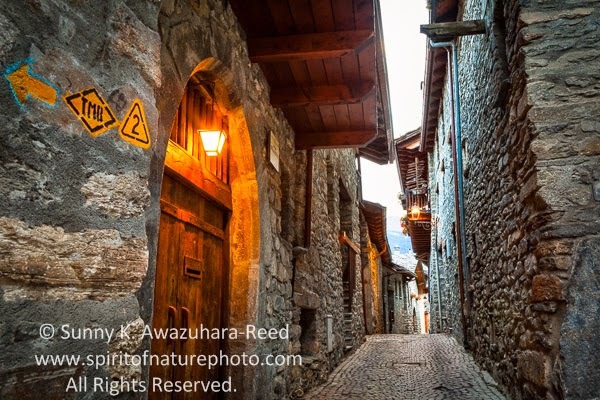 The town is made up of narrow cobble stone streets with old stone buildings and a chapel... 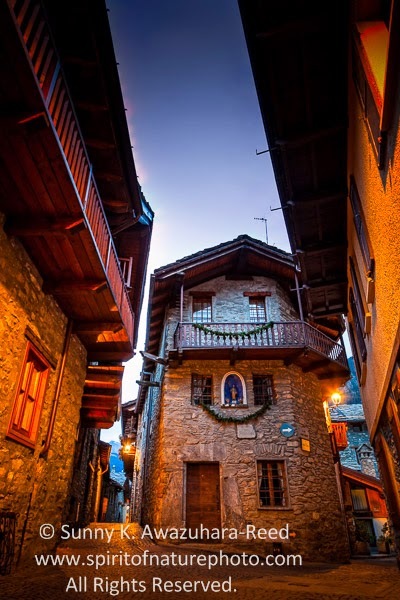 The old part of the town, Dolonne, is a historic mountain village with a charming atmosphere. People are still living here without development as a tourist attraction. I spent a few hours photographing this old area. 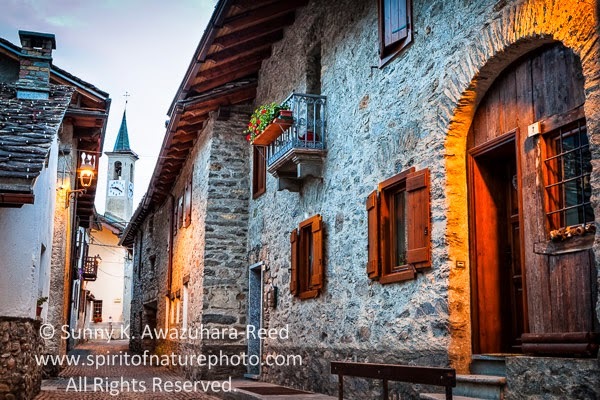 Here is the City Center, the tourist part of Courmayeur. This story will continue to the next update. Please check back.